Sears Canada Holiday Deals: Kenmore Pro Heavy Duty Professional Blender, for Just $149.97! 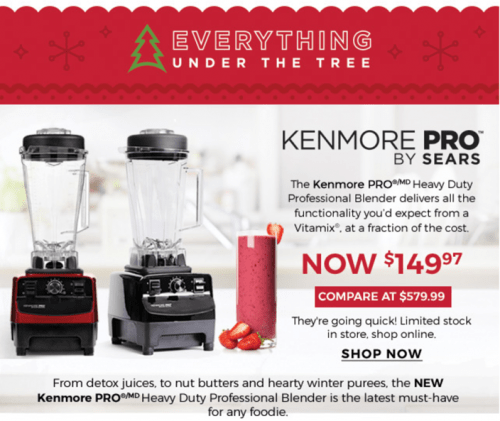 Winter purees, soups, sauces, detox juices, nut butters, smoothies and more are only a press of a button away with this new Kenmore Pro Heavy Duty Professional Blender at Sears Canada! This Kenmore Pro Blender is available online in a red colour or black colour and you can get it for only $149.97 (compare at $579.99 – save $430 – 74% off ) with FREE shipping! Variable speed dial, with your choice of 11 different speeds. 8.7 L x 7.7 inch – W x 19.5 inch – H, 1 year warranty. Follow instruction manual for cleaning and care of the Kenmore blender. Features a safety switch and an overheat reset button. On/off switch, pulse switch and cord storage system. Includes a 2L jug, jug lid, lid plug, tamper, and recipe book. 6 stainless steel rotating blades made in Japan. Weight (lb.) 9.48 and Height 14.17. This highly versatile Kenmore Pro blender features eleven speeds for great processing every time. It’s easy to pour and easy to clean, helping take the stress out of meal prep. Sears Canada is offering FREE shipping on online orders over $99. And, it’s always FREE to ship to store! Also, you can return your purchase to any Sears store or mail it back and they will refund the cost of your item. Click here to get this Kenmore Pro Blender for $149.97 at Sears Canada! Click here to shop online at Sears Canada! This is the retail price of the blender, it is simply comparing the price of something like a Vitamix. It was on sale about a week ago for $99. It is a great blender though.